At last, you realised your cherished dream, a boat! So, now you need...a boat dehumidifier? But which is the best type for a boat? I can help with some general tips on choosing the right model for your vessel and reviews of the most suitable units available. A boat can be very basic or palatial inside but, if it has sleeping berths, a galley, heads and showers, it's a compact home from home, a kind of marine RV. Just like home too, the contents, the fixtures and fittings, even the fabric of the boat, can be damaged by excess humidity. This is where a boat dehumidifier comes in. When the interior of the boat cools and the water vapor condenses it creates damp. That damp can cause corrosion, mold and mildew, staining and other damage as well as making the boat uncomfortable for you. If you're a weekend sailor your boat will spend far more time at its moorings than on fishing trips or cruising and it's when the boat's closed up that the worst damage can occur. A boat dehumidifier can prevent this and give you greater peace of mind. It's an even bigger problem if your moorings are a couple of hours or more from home and you can't get to see to your boat as often as you'd like. Most people know how to care for their boats, and there are other sites better qualified to advise on boat maintenance than ours. If you do have a problem with humidity however, and nothing else has cured it, we can offer some help with choosing the best dehumidifier for your boat. 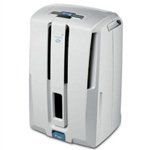 The first thing to decide is when and where you are going to use your dehumidifier. If you only intend to use it while the boat is moored at "home" then you may have more options. If you want to take it with you on your trips, whether or not you use it while sailing, you are a little more constrained. Boats are usually fairly tight on space. If your boat dehumidifier travels with you it needs to be compact. Boats on the water, especially on the ocean, move a lot. Stating the obvious I know but think about it. Boats move in three dimensions, two in the horizontal plane and also in the vertical, in a light swell let alone a storm. They also move about their own axes, roll, pitch and yaw. A boat dehumidifier that has a low centre of gravity, is short and squat and ideally heavier at the base, will cope with these conditions best. The best model for a boat will also have non slip feet, rather than wheels or castors. These precautions reduce the risk of damage to the appliance and to anything else it may collide with, including the crew! If your boat dehumidifier requires constant electric power there are several things to consider. Your boat's electrical system. Can it cope with the load? Is it safe? Any electrical system you may hook up to. Marine electrical systems have to reach more demanding standards than those in our homes because of the ever present water and other concerns. Please seek qualified expert advice on these points. Is your appliance ignition protected? US Federal law requires that electrical devices used in the engine compartment or bilges be "ignition protected" meaning they won't create sparks that can cause a fire or explosion. It is advisable to have this feature even if you plan to locate the unit elsewhere on the vessel. There is always a risk, however small, of an electrically powered device, left running and unattended, causing a fire. I'm not aware of it happening to anyone in my circle but it has been known. If your boat dehumidifier will be left running in your absence it should be fitted with a humidistat, so it will stop operating when humidity drops below the threshold you have set, and automatic restart is a must or a power outage will leave your boat with no protection until you return. The best manufacturers always include this feature. The facility to drain out is also essential as the buckets can only hold a limited volume and the appliance will automatically shut down if the bucket is full. Any refrigerant model should also have hot gas defrost if you expect the temperature to fall below about 60°F/15°C or again it will be ineffective. If you live in the UK and are looking for a portable with hot gas defrost for use in your boat the Mitsubishi-MJ-E16V is hard to beat. You can read my review of the Mitsubishi-MJ-E16V here. Models that use the water absorption power of desiccants, combined with a rotor, avoid the problem of freezing in low temperatures. This type still requires a constant power source however. This technology, in a form affordable to you and me, is still quite new. Among the best on the market is the Meaco DD122FW which has received outstanding praise in reviews written by boat owners who have used it. Unfortunately this unit is not available in the USA at present but is easily found in the UK. For more information see my review of the Meaco DD122FW. Boat owners in the USA have little choice but to use a portable refrigerant unit although these are only suitable for use when the vessel is moored in still water or is out of the water. A compact unit is always desirable on a boat and I would recommend the DeLonghi 50 Pint model. Despite the "50 pint" tag of the DeLonghi it is a 25 pint unit at AHAM standard test conditions. It is well rated in reviews by consumers and has a built in pump which may be helpful if you want to discharge the water outside the boat. The drawback of an ordinary portable is its ineffectiveness at low temperatures and if you need an appliance for this purpose there are none available with hot gas defrost. The best option, if you are not put off by the price, is the Ebac CD30. This is a rugged, industrial unit that will operate effectively at temperatures down to 33°F/1°C. It is compact and has a low centre of gravity so will be more stable when there is movement on the boat. It is possibly the best choice for a boat available in the USA at this time. While most of the boating community use their craft for recreation or sport there are some of you who love life on the water so much that you live in your vessel year round. In these situations, living on a houseboat for example, it's important to control humidity in order to keep mold and mildew in houseboats at a minimum. This is pretty much essential when it's cold outside and if you are looking for a dehumidifier for a houseboat it is even more important that you choose a model that will operate effectively at low temperatures. Whatever form of boat dehumidifier you choose, please remember that to be effective your boat should be sealed up against the external atmosphere while it is operating.